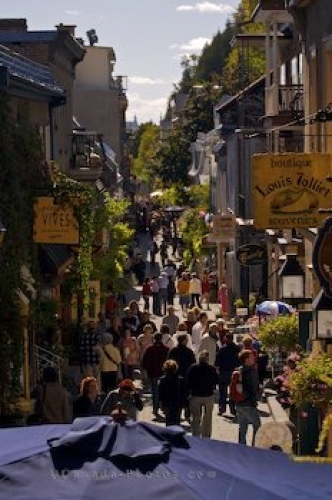 During the summer months, the Rue du Petite-Champlain in Quartier Petite Champlain is filled with tourists that visit Old Quebec on their vacations. A very popular place to go where you will find unique shops, cafes and restaurants housed in historic buildings lining the pedestrian only streets of Quartier Petite Champlain. Crowds along Rue du Petite-Champlain in Quartier Petite Champlain, Old Quebec, Quebec City, Quebec, Canada. UNESCO World Heritage Site. Picture of tourists strolling the street in Quartier Petite Champlain in Old Quebec.